Blue Taxicab was the largest taxicab firm in Kowloon with a fleet of hundreds of cabs and was founded in 1928 by Tsan Yung (曾榕, 1889-1970). A native of Weiyang in Guangdong province, Tsan Yung was orphaned at the age of 5 and left his hometown at the age of 19. He worked as a miner in one of the islands in the Pacific Ocean and taught himself English and engineering by reading at night. He was soon promoted to interpreter and supervisor at the mine before moving to Hongkong in 1923 to work for British mining company. In the early 1920s the Kowloon peninsula was still relatively undeveloped and getting around was relatively difficult. Sensing an opportunity, Tsan started Blue Taxi in 1928 with 10 taxicabs and within a decade he had 80 cabs. During the War his entire fleet of taxis were confiscated by the Japanese – rather than collaborating with the occupiers, Tsan moved his family to the fishing town of Tai O in Lantau island. After the War, Blue Taxi resumed service in August 1946 with 8 cabs (10 h.p. vehicles made by UK firm Hillman) charging the rate of $1 for the first mile which was significantly higher than the 1941 rate of 40 cents and 1937 rate of 30 cents. More Hillmans were ordered and very quickly Blue Taxi rebuilt his fleet to 150 which surpassed its pre-war number and also became the first cab company in Kowloon to use a meter. 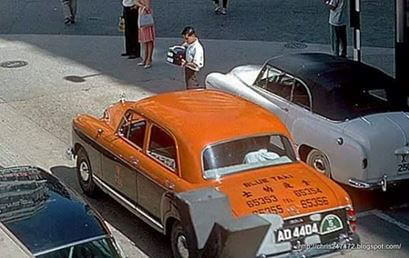 In December 1959, Blue became the first taxicab company in HK equipped with wireless communications for drivers. Blue Taxi from the 1960s. The garage of Blue Taxi was initially located at the corner of Nathan Road and Market Street. In 1964, Tsan Yung built the 12 story, 72 units Tsan Yung Mansion at 70 Waterloo Road in Homantin. He and his family occupied various floors of the building and the first two floors served as the garage and head office of Blue Taxi (and currently a public parking lot managed by Wilson Parking). By 1967, the firm had 169 cabs and aside from Tsan Yung Mansion, the family also invested in real estate through the holding company Yung Hing Investments. 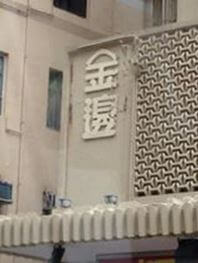 The Chinese name of Blue Taxi still visible in the façade of Tsan Yung Mansion on Waterloo Road today. Aside from managing his taxicab empire, Tsan Yung was active in the community affairs of Kowloon. He was one of the founders of the Kwong Wah Hospital (which merged with Tung Wah and Tung Wah East hospitals to form the Tung Wah Group of Hospitals) and the Kowloon Chamber of Commerce. He also helped funded the establishment of the Kaifong Welfare associations in Mongkok and Yaumatei. Tsan Yung had 6 sons and 2 daughters and in the 1950s-60s, his fifth son Tsang Pui-hang (曾佩珩,graduate of DBS) and his sixth son Tsang To-Piu (曾標1924-, graduate of Pui Ching and Lingnan), were both active in the management of Blue Taxi. However, after the taxicab market was deregulated in the 1960s and after Tsan’s death in 1970, Tsan’s descendants decided to exit the taxi business in August 1977 (at which point they still owned 100 cabs) and laid off its remaining 200 drivers. 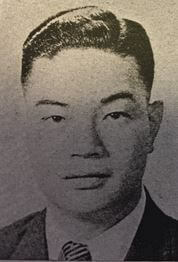 Tsan’s seventh son Tsan Pui-Chiu (曾佩釗) studied aviation at the Spartan School of Aeronautics in Tulsa, Oklahoma and served in the Chinese Air Force during the War. He was involved with two publicly listed companies – International Restaurants and Nightclub which he served as chairman and Winton Holdings, one of the largest taxi financing companies, which he was the second largest shareholder. Two prominent third generation members of the Tsan family are Lana Tsan (曾慶謙), who was well known as a dog breeder, dog show promoter and pet food businesswoman before her sudden death in 2010 and Thomas Tsang (曾慶光), the co-founder of Air Hong Kong (sold to Cathay) and vice president of the CNAC Group. Central Taxicab was one of the leading taxicab companies in Hong Kong and its founder Wu Chung (胡忠,1902-1991) owned the largest fleet of taxicabs in HK at one point (equivalent to half of all cabs on the road). A native of Fa Yuen in Guangdong province, Wu Chung started out as a hog farmer in Pokfulam. Sensing better opportunities in the transportation field, Wu became a gypsy cab driver and soon saved enough to buy his own cab in 1926. Within 2 years, he expanded to 8 cabs, however his operation was still unlicensed. In 1934, he entered the licensed cab business through the acquisition of 12 licensed cabs from Yellow Taxicab for $18000. By the outbreak of the Pacific War, he had 40 cabs in his fleet. After the War, Wu rebuilt his taxi business with the help of his eldest son James Man-hon Wu (胡文瀚,1920-2006), who had trained as a cab driver as a teenager and worked as a mechanical engineer for the highway bureau of the Kwangtung provincial government. As a side note, James also established China Cold Storage & Engineering Co in 1952 which became the first air conditioner manufacturer in Hong Kong under the Weatherite brand using licensed technology from Westinghouse. Despite of his lack of education, Wu Chung was an innovative entrepreneur whose innovations helped to propel him to the top of the taxi business. In the late 1940s, Wu Chung introduced diesel powered taxis, which helped to reduce his operating costs. Inspired by what he saw on a trip to Japan, Wu introduced the first cabs with a roof light in Hong Kong in 1962, enabling customers to easily differentiate his cabs from other vehicles at night. He also insisted on an additional enhancement which enabled drivers to turn off the light when the cab was hired, a feature that was allegedly a global first. The firm’s phone numbers were 30000 and 22188 – both very easy to remember and the second very auspicious in the Chinese language. Aside from Central (which was incorporated in 1962), the Wu family was also involved in New Taxicab (see next section for details), HK & Shanghai Taxicab Co Ltd (founded in 1929 by She Tat-cheong 佘達昌, comprador of the one of the ships of HK Canton Macao Steamboat Co who died in 1953 at the age of 72) and Grand Taxicab Co Ltd (大中的士, incorporated in 1965). By the late 1940s his fleet had grown to over 100, by 1958 over 200 and by 1967 close to 500. With the cash from the taxi business, the Wu family invested in real estate. 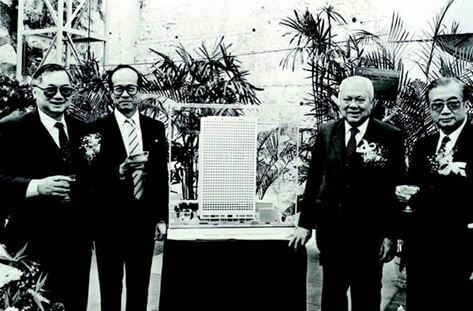 Through Central Enterprises, Wu Chung developed Central Mansion at 539 Jaffe Road in Wanchai and the 26 story Wu Sang House (胡社生行,named after his father) at 655 Nathan Road in Mongkok, which was the tallest building in Kowloon when it opened in 1966 and featured the first revolving restaurant in HK on its top floor. 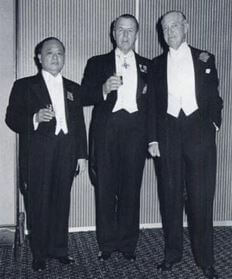 In the 1960s, Wu Chung’s younger sons – Gordon Ying-sheung Wu and John Ying-bun Wu, returned from college in the United States and joined the family business. The taxi industry by then however was plagued by labor unrest and the problems reached its zenith during the 1967 riots when 60 percent of cabs were not running due to strike or other reasons. According to Gordon Wu who handled the negotiation at Shanghai Taxicab which he was the managing director of, many of the drivers were more driven by Communist rhetoric than seeking better compensation. The family decided to sell its entire fleet of 500 taxis to its drivers through monthly installment plans and concentrate on property development. Gordon’s Hopewell Holdings became a major developer of infrastructure projects in Asia (China and Thailand in particular) and a leading property developer in Hong Kong – particularly in Wanchai which was the former base of Central Taxicab. 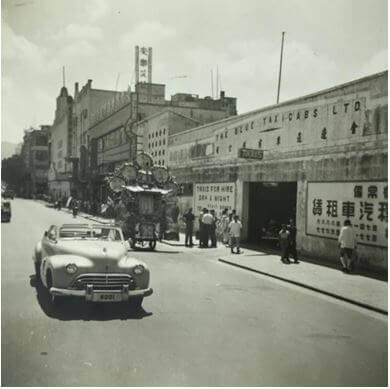 While the Wu family primarily operated Central Taxicabs on the HK island side, they were also involved in New Taxicab, a major taxicab company on the Kowloon side in the 1950s and 1960s. Their partners in New Taxicab were the firm’s chairman Chan Nam-Cheong (陳南昌, 1911-1970) and director Cheng Chung-Kwan (鄭中鈞,1913-1976), who were prominent merchants and philanthropists in their own right during that era and the duo were partners in both business and philanthropy. A native of Xinhui (one of the four counties in Guangdong known as Sze Yap), Chan went to Australia at an early age and was educated at Christian Brothers College in Fremantle. He learned the construction trade in Australia and moved to HK in the early 1930s. In 1932 he was listed on the HK Jurors List as a clerk for the architect Arthur George Hewlitt and he was said to be involved in the construction of King Yin Lane, the Chinese palatial mansion at 45 Stubbs Road commissioned by his Australian Chinese friend Mrs. Shum Yat-chor in 1936. By the late 1930s, Chan was already quite prosperous through construction and properties and when HKU graduate Lo Kwee-seong needed funding to start HK Soya Bean Products Co Ltd (now Vitasoy International) in 1940, he reached out to Chan who became a founding director of the firm. Chan also developed some properties in Sham Shui Po but contrary to some belief, Nam Cheong Street in the district was actually not named after him. Cheng came from one of the richest families in Asia and was a great grandson of the famous Malaysian Chinese Kapitan Cheng Keng Quee. He was born in Canton and upon graduation from St Joseph’s College in HK joined the family property business Kwong Hoi Kee. When the Wu family reorganized and incorporated New Taxicab in 1947, Chan and Cheng joined in as investors and Chan was made the chairman of the board. According to news report of its shareholder meeting in 1955, New Taxi made $300,000 in profits in 1954 which was not a small amount at the time. The firm operated out of 42 Parkes Street in Kowloon and was dissolved in 1968, one year after the riots. 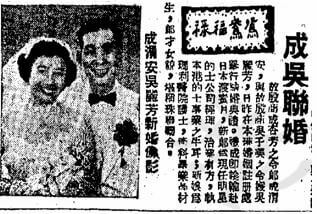 Aside from New Taxicab, Chan, Cheng and the Wu family also jointly invested in Golden Star Theatre in Shau Kei Wan, which operated from 1954 to 1972. Outside of business, both Chan and Cheng were very active in the community. 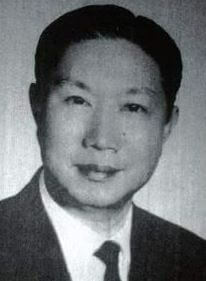 Chan had served as president of the HK Sze Yap Commercial & Industrial Association and president of a number of important sports organizations in the 1950s -the HK Football Federation and Asia Football Federation (1957-58), South China Athletic Association (1954-55), and HK Basketball Association (1955-56). He was also a generous philanthropist and today there are 3 schools which are named after him and 2 schools that are named after his wife. 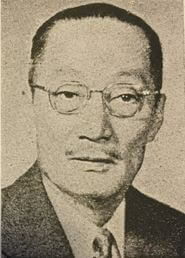 Cheng was a co-founder of the HK Tsang Shing District Citizens Association and served as chairman of the North Point Kaifong Welfare Association for two decades. Chan and Cheng were both major contributors to the HK Juvenile Care Centre and Cheng had served as its chairman. A Star taxi on the left in Central in the late 1940s, early 1950s. 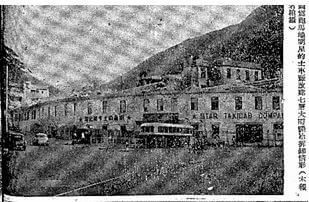 Star Taxicab was one of the leading cab companies on Hong Kong island from the 1930s to 1960s. The firm was very astute in marketing – with its lone star logo on the back, its cabs were easy to spot and its phone number 23456 was also extremely easy for riders to remember. Although the firm’s focus was on the HK island side, its founder Shing Hang-Fong (成杏芳) actually had deep roots in Sai Kung in New Territories where the family has settled for generations (the late actor Shing Fui-On 成奎安 was also a member of the same clan). The firm was incorporated in 1935 and by the outbreak of the Pacific War, it already had a fleet of 60 cabs. In 1938, its office was listed at Ewo Street and it had taxi stands at Star Ferry Pier and Pedder Street in Central and the Upper and Lower Peak Tram stations and Choy Wing-chiu was listed as the company secretary. After the War, Star Taxi resumed services in 1946 and rebuilt its fleet under the leadership of the founder’s son Shing Wai-On (成渭安). In 1954, the Shing family decided to re-develop large part of Star’s 10000 square feet garage at 33 Wong Nai Chung Road in Happy Valley into a seven story building (tallest building in Happy Valley at the time) while keeping part of the land as its garage. 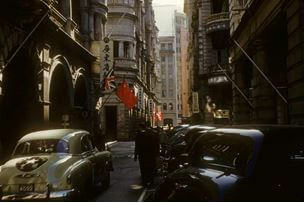 The firm listed its head office as the Stock Exchange Building in Central in 1949 and Henry House in Central in 1963. In 1967, it had 70 cabs in its fleet but like his peers, eventually the Shing family decided to exit the business. 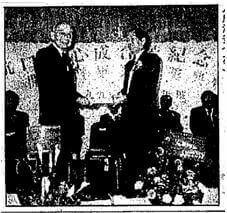 In 1987, Shing Wai-On contributed HK$1.3 million to the establishment of the Hang Hau Shing Hang Fong Memorial Primary School in his native Sai Kung. This article was first posted on 24th March 2017. Very interesting! Living just around the corner from No 70, Waterloo Road, we have often commented on the building because it is quite handsome and has a second floor facade similar to the old Hilton Hotel in Central. Now we know at least one reason why Park’n Shop occupied part of the ground floor – presumably they could actually offer free Parking in the Blue Taxi’s garaging space in the floor above.